So far in ‘My Top 5 Cydia Tweaks’ we’ve detailed tweaks and applications for jailbreak users from a handful of categories, including Messaging, Security, and most recently FREE Cydia apps and tweaks. It’s time to add another 5 programs to the list, this time condensing some must have packages that will help you increase productivity when it comes to your iDevices Networking, Communications, and Browser. With the popularity of our latest ‘My Top 5 Cydia Tweaks’, I’m pleased to announce that here-in, you will notice the integration of a lot more free tweaks to the series! SpotURL is a simple but amazing tweak that enables you to surf the net right from your Spotlight. Type a subject or URL into your Spotlight search, and SpotURL will automatically list the website with the option to open in Safari.app, as well as messages from the Mail.app with your subject in their content. With no settings to configure, this tweak is a no-brainer. SpotURL is available FREE through the BigBoss Repo. WiFiFoFum is a wifi scanning application. “I have one of those already..” you might say, but don’t be fooled, it includes a massive amount of features and dwarfs those of the integrated iOS wifi options menu, not to mention its overall range and speed. The apps main features include a powerful network scanner with configurable ‘sensitivity’, and a futuristic ‘radar’ that shows you accurate locations of your nearby networks, which is handy when you’re out and about and you need to get closer to a signal. WiFiFoFum is also available through the BigBoss Repo for FREE. 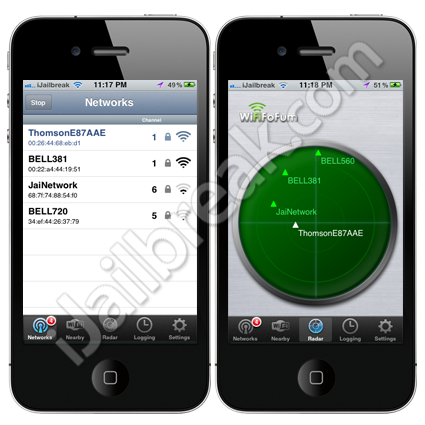 3G Unrestrictor is a great tweak which tricks any WiFi restricted application into working over your 3G network. Most notably is 3G Unrestrictors ability to allow ‘FaceTime’ on 4th generation devices as well as the iPad 2, although other applications such as Skype can benefit. You can even stream high quality YouTube videos over your 3G network, instead of having to be connected to a WiFi signal. This tweak does exactly as the name states, it integrates an easy to use download manager into Safari.app. Safari Download Manager supports the download of images, videos, and even file formats not supported for playback or use on the iPhone, such as .dmg files. Files can be downloaded and transferred to your computer with ease. The tweak also adds a ‘Downloads’ tab to the bottom of your browser, which displays your finished downloads, and an option to clear the list. Safari Download Manager is available in the BigBoss Repo for the purchase price of $5.00. WhatIP is a very simple application which displays the IP address of your connected network with the push of a homescreen icon. What more can I say? WhatIP is available FREE through the BigBoss Repo. Well folks that wraps up ‘My Top 5 Cydia Tweaks’ for networking and browsing, feel free to list your own ‘My Top 5’ in the comments section below. For the latest and greatest tweaks and applications out of the jailbreak community, keep your screen glued to iJailbreak.com. Enjoy! I was trying to find more to do with Spotlight so #1 is the best tweak for me here, though they’re all of quality. Had SpotEnhancer from Tweakweek but SpotURL is more of what I need. Thanks for the list.